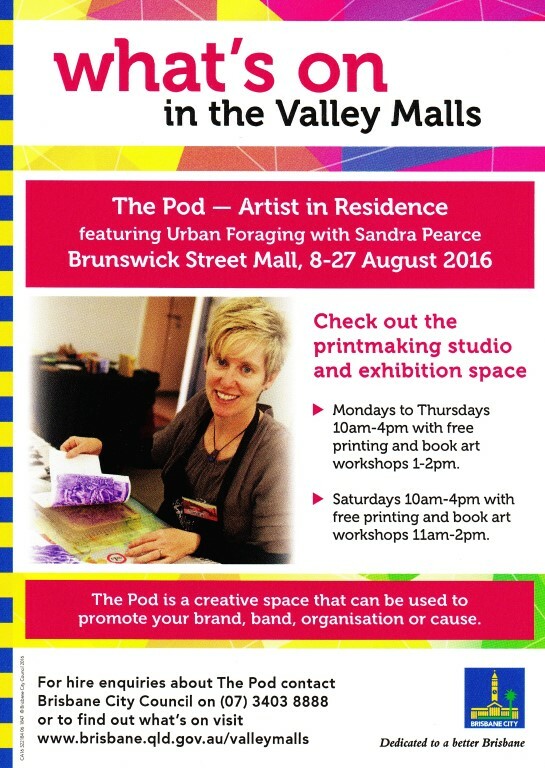 From Monday 8 August to Saturday 27 August 2016 I'll be the Artist In Residence in the Valley Mall in Brisbane's Fortitude Valley. I've been awarded an Artist in Residence in 'The Pod' for three weeks in August. My residency is titled "Urban Foraging", and I'll be creatively exploring the Valley Mall area within the context of cultural connections between inner-city communities and nature. How is the natural world represented in the Valley Mall urban environment? What cultural symbols or imagery have been influenced by nature? A planned outcome of the residency will be an installation project - I'll be working on a non-codex sculptural artist book using prints and text inspired by the local area. I'll be posting to my Blog every couple of days about what I'm doing at the Pod. During the residency I'll be running free art experiences for everyone. The workshops will be advertised by Brisbane City Council as being held at 1pm daily, but I'll be offering them on an adhoc basis as required, so please feel free to drop in anytime for a play. Easy Relief Printing – Create your own personalised stamp using lino tools and Ezy-Carve rubber material. The focus will be on inspiration from the Valley environment and prints will be used in the installation artwork. Urban Notebook – Create a simple but cute Japanese stab bound notebook incorporating decorative papers and found local papers. Allow a minimum of half-an-hour for each activity, or you can stay longer if you like. There's plenty of places to eat in the Mall as well as a cafe close by that I'm assured sells good coffee! For added attraction, Oxlades Art Supplies are just up the road and there's markets on in the mall on Saturdays. Feel free to SMS or email me if you want to let me know you're coming or if you have any queries, my contact details are on my contact page.